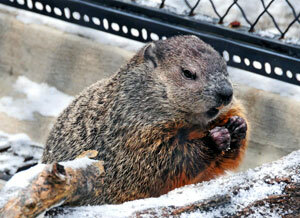 Thank you to everyone who visited the Zoo to join in the annual Groundhog Day ceremony. Wynter appeared from her "burrow," and did see her shadow. According to the tradition, this means we can expect 6 more weeks of winter. Groundhog Day stems from the tradition that hibernating animals are able to predict the arrival of springtime by their emergence. Farmers would use it to determine an early or late planting season. After spending a few minutes in the chilly temperatures, and enjoying a few pieces of banana, Wynter returned to her warm and cozy area inside the Family Farm's Animal Encounter Building.